Israel’s prime minister convened his Security Cabinet late Thursday to plot a response to a new burst of Gaza terror, ordering the IDF to take unspecified “strong action” as the military reinforced units along the border ahead of a possible escalation. Fighting showed few signs of slowing. Late on Thursday, the IDF flattened a well-known cultural center in a crowded Gaza City neighborhood, claiming it was a Hamas military base, as terrorists continued firing rockets toward Israel throughout the evening. 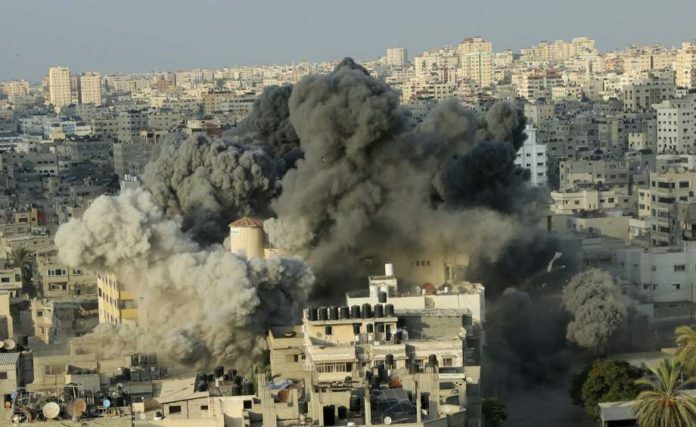 In all, Israel carried out dozens of airstrikes during the day, while Hamas fired nearly 200 rockets into Israel, wounding seven people. Israel’s Channel 10 TV said Prime Minister Benjamin Netanyahu delayed the meeting of his Security Cabinet by two hours to allow the Egyptians to press forward with their work. It did not elaborate. But shortly before the meeting, Netanyahu and his defense minister, Avigdor Lieberman, met with top military officials to discuss their options. Lt. Col. Jonathan Conricus, a military spokesman, said Israel had “ground troops that are ready to deploy. We are reinforcing the southern command and Gaza division.” He wouldn’t comment on Israeli media reports of troops preparing for a possible ground operation. Israel and Hamas have fought three wars since the terrorist group seized control of Gaza in 2007. Despite the animosity, the enemies have signaled, through their contacts with Egypt, that they want to avoid another war. Thursday’s fighting, however, brought back memories of the most recent war, in 2014. Air raid sirens wailed in southern Israel overnight and throughout the day, sending families scrambling into bomb shelters, canceling outdoor summer cultural events and forcing summer camps indoors. A rocket struck the southern city of Beersheba late in the afternoon, landing in an open area. It was the first time a rocket had hit the city since the 2014 war. Shortly after, an Israeli airstrike flattened the five-story cultural center in the Shati refugee camp, a crowded neighborhood of Gaza City. The airstrike set off a powerful explosion and sent a huge plume of black smoke into the air, causing crowds to scream in panic. Medical officials said at least seven bystanders were wounded. The building is home to a popular theater and exhibits plays and other shows on a daily basis. An Egyptian-Palestinian cultural society also has an office in the building. “The deliberate targeting of a cultural center with airstrikes and destruction … is a barbaric act,” said Hazem Qassem, a Hamas spokesman. He said the destruction of the Egyptian cultural office was “an Israeli attempt to sabotage” the Egyptian cease-fire efforts. At the United Nations, Israel’s ambassador, Danny Danon, urged the secretary-general and U.N. Security Council to condemn Hamas militants for what he called “the unprovoked terrorist attack” on southern Israel. In Washington, State Department spokeswoman Heather Nauert said U.S. officials were concerned by the situation in Gaza. “Overall, we condemn the launching of missile attacks into Israel, and call for an end to the destructive violence. We’ve seen reports that 180 or so rocket attacks have taken place, shot from Gaza into Israel, and we fully support Israel’s right to defend itself, and to take actions to prevent provocations of that nature,” Nauert said. Israel and Hamas have engaged in several bouts of fighting this month. The latest round erupted Tuesday, when the Israeli military struck a Hamas post in Gaza after it said terrorists fired on Israeli troops on the border. Hamas said two of its fighters were killed after taking part in a gunfire parade inside a terror camp.